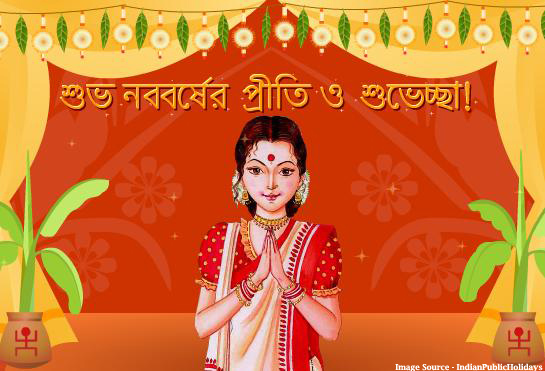 Bengali New Year (Bengali: নববর্ষ Nôbobôrsho (from Sanskrit Navavarsha=New Year) or Poela Boishakh (পহেলা বৈশাখ Pôela Boishakh or পয়লা বৈশাখ Pôela Boishakh or Poila Boishakh, from Sanskrit= Pahela Vaisakhi) is the first day of the Bengali calendar, celebrated in both West Bengal, India and Bangadesh. Freshly printed calendars with the scent of ink and new paper, boxes of sweets and the forbidden Fanta on the lap of an indulgent father – personal, nostalgia of the Bengali New Year ’s Day. 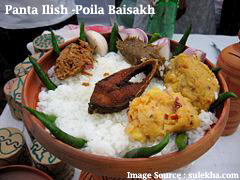 Celebrated mid April (14th) this is a Bengali festival irrespective of religious or regional origins. Mughals collected agricultural taxes according to the Hijri calendar. it didn’t coincide with the harvest. So Akbar ordered changes and Fatehullah Shirazi, a scholar and astronomer, formulated the Bengali year on the basis of the Hijri lunar and Hindu solar calendars. The new Fasli San (agricultural year) was introduced on 10/11 March 1584, but was dated from Akbar’s ascension to the throne in 1556. Poila Boishakh started from Akbar’s time. All dues were cleared on the last day of Choitro. On the next day, or landlords entertained their tenants with what else but sweets – the indicative epitome of Bengaliness. Time went by and the occasion became turned into a day of merriment. Traders started their new book of accounts on this day. Poila Boisakh sees the Bengali Sangit Mela (Song fest), held at Rabindra Sadan, sponsored by the Government of West Bengal. A day before the Poila Baishakh, that is 14 April, people will mark Sankanranti in which they start the day with ‘Satu and Gudd’. The day involves some prayers and placing of idols in water. It is celebrated in the month of Vaishakh or Baisakh. In 2011, Naba Barsha or Poila Baisakhis is celebrated on April 15th (Friday).